MP Fouad al-Saad, member of the Parliamentary Democratic Gathering bloc, has called on the Free Patriotic Movement (FPM) bloc to forgo their planned street rallies on 28 September and 7 October to pressure political parties to respect the National Pact in order to elect a president and appoint senior military officials. Saad said the FPM should be focusing on achieving its objectives through consensus and compromises rather than seeking for solutions in the streets which could cause chaos. Jebran Bassil, FPM’s leader, claimed that they would “topple the government” with the rallies and said other parties should join them to uphold the “partnership” and the National Pact. The 1943 National Pact is an unwritten agreement that set the foundations of modern Lebanon as a multi-confessional state based on Christian-Muslim partnership. 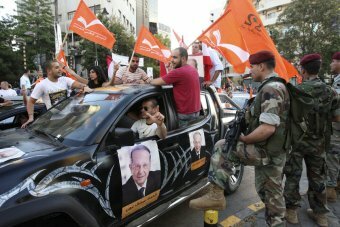 Saad accused Bassil of “hiding behind the constitution and the Christian rights to shoot, with the support of Hezbollah, at everyone who disrupts the election of General Aoun as a president.” He pointed out that “Christian rights start with electing a new president; however, it doesn’t end by doubting the Christianity of the Army Commander General Jean Kahwaji.” The latter’s term has ended in the military but the cabinet can’t agree on whether to extend it or not. Meanwhile sources have also stated that Hezbollah is yet to decide on taking part in the street rallies. MP Saad warned that escalating tensions will not make Michel Aoun president and Prime Minister Salam will continue to steer the affairs of the state until a president is elected. Lebanon has been without a president for more than two years and the situation has raised concerns that it could lead to a failed state as there are no signs of political parties reaching a consensus to elect a Maronite Christian as president. Written by: Peter Mulvany on September 15, 2016. Posted by Peter Mulvany on Sep 15 2016. Filed under Headlines, World News. You can follow any responses to this entry through the RSS 2.0. Both comments and pings are currently closed.